With an effective focal length range of approximately 16-35mm in 35mm format, the Canon EF-S 10-22mm f/3.5-4.5 USM is a remarkable lens with outstanding image. Creative photographers can use this lens to get extremely close to subjects, exaggerating the difference in size between a near object and its background to create excellent separation between subject and background. Designed specifically for digital photography, the Canon 10-22mm f3.5-4.5 lens has specially shaped lens elements and Super Spectra coatings to suppress ghosting and flare. An exclusive optional lens hood can further reduce the incidence of flare. 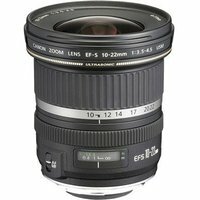 The EF-S 10-22mm f3.5-4.5 USM is for use with Canon DSLRs with an APS-C sensor, and is not suitable for full frame.